Hello everyone, this is my first post (kind of exciting! ), and I plan on buying a new telescope in the near future. 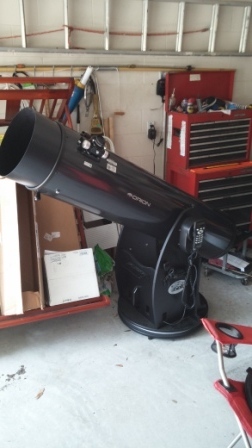 I wanted to know what the best choice for a 12" dobsonian (no go-to or tracking) would be. As of right now, I have an Orion XT8 Plus, which is great, don't get me wrong, but I wish I had just gotten a 12" instead. I guess I caught a case of aperture fever haha. Any help would be greatly appreciated. I recommend the Zhumell 12" or Orion's SkyLine 12". They're the same scope with different decals. I read on one of the CL forums that GSO shut down the Zhumell line a few months ago. You'll have to find one used if you are set on a Z12. I think Apertura is the same scope. Zhumell is gone so they are only available used. So, what is your budget? Unfortunately, I see the SkyLine is "Not available for sale or delivery to California addresses"
Poking fun at the land of fruits and nuts I live in are welcomed. Is price an issue? Do you want the best mass-market 12-inch Dob or the best 12-inch Dob regardless of cost? For what it's worth, for reasons of tradition, 12.5 inches is actually a much more common size than 12, at least among custom-built scopes. Edited by Tony Flanders, 02 March 2018 - 05:36 AM. Remember, you said the BEST. That means the best mirror on the best base with the best focuser. That means a high price. Or do you mean the best choice on a limited budget? now we are talking Z12, Apertura 12, Orion Skyline12, Orion XX12i, Meade Lightbridge 12, Skywatcher 12, Explore Scientific 12 and similar. They are good scopes, but they are not the best. They are midrange commercials scopes. That will show you a lot and serve you for years, but they are not the BEST. In fact they are all about equal. It all comes down to budget. What is your budget? Do you have the budget for the BEST, or are you trying to find the best you can get within your limited budget? Edited by aeajr, 02 March 2018 - 09:36 AM. I should have clarified on price range, my fault. I would like the best for my price range, probably looking to spend around $900-$1,000. So I guess, not the best scope, but a high quality scope within that range. Yeah I saw that too. I was looking at the Apertura AD12, I've heard some good reviews about that scope, can anyone confirm? Apertura is the same GSO scope as Zhumell and Orion's SkyLine. Get one if you can. The Orion-not-shipping-to-California policy is because of formaldehyde in the particle board base. Apertura, Orion, Skywatcher, are all good. The tube and mirror, at least, come out of one of two factories both of which would be considered good. They differ mostly by accessories and many have identical accessories and sell at the same price. Skyline and Apertura are the same scope. I would happily have either of these. Since you have an XT8 you understand what a Dob is. You likely have accessories, extra eyepieces, added Telrad or other finder, maybe a laser collimator, filters, etc, so I don't know how much you care about the accessories that come with the scopes. You said no GoTo or tracking but I did list the Intelliscope. It finds but does not have motors. I have the XT8 intelliscope. Can use it with the computer or strictly manual, depending on what I am trying to find. I don't know about your storage or transportation needs so I don't know if a collapsable or truss are valuable to you. A 12 is going to be bigger and heavier than your XT8. to find out what telescope they have, what eyepieces they already own, etc. Edited by aeajr, 02 March 2018 - 12:32 PM. Glad the dangerous chemical properties of formaldehyde are limited only to California ! Be aware that a sold-tube 12-inch Dob is really big, heavy, and clumsy. Most adults can handle the tube, but it's a serious burden. That's why this is about the point where many if not most people switch to truss-tube construction. Or at least the collapsible Skywatcher, which gets very good reviews. Glad the dangerous chemical properties of formaldehyde are limited only in California ! fify. I don't plan on eating any dobsonian bases so I should be ok.
Best to look at a truss or collapsible Dob in that size mate. A 12” Dob is a big heavy beast. Explore Scientific, Skywatcher, and Orion have good options for this. Formaldehyde, from memory, can off gas out of the particle board so there is a risk beyond eating it. Remember the FEMA mobile home formaldehyde disaster of a few years ago? My Apertura AD8 is an excellent little grab and go scope. Gives very good views. I used to have an Orion solid tube 12" Dob. It was a real crowd pleaser. I miss it. I have a friend with the 12 inch collapsible Sky Watcher. The collapsed tube is shorter which is good but it's still a big, heavy tube and base. If Brandon has a vehicle that can handle the 12 inch Apertura, that would be my choice. I have some pretty big scopes but every time I see a 12 inch F/5 Dob, I surprised how big it is, probably because I comp are it subconsciously to my 10 inch F/5. Thanks, I think I'll look into the Orion SkyLine 12" in that case. The weight really isn't an issue, I'm only 20 and in good shape, so I'm not worried about that. 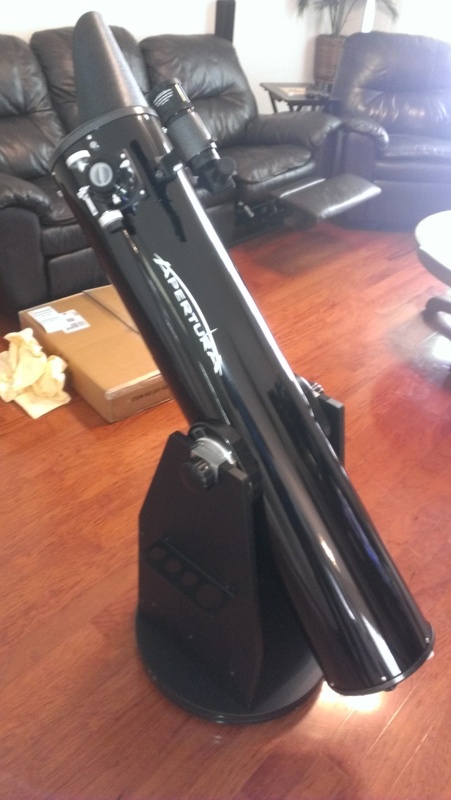 Look at the 12" Meade LightBridge--also a GSO but much less difficult to transport.